Situated in southern, central Texas, is the beautiful, historic San Antonio. This charming destination, with more than 1.4 million residents, is where you can discover Texas’s story of its independence. San Antonio offers you a memorable family holiday, with gorgeous architecture and plenty of activities. 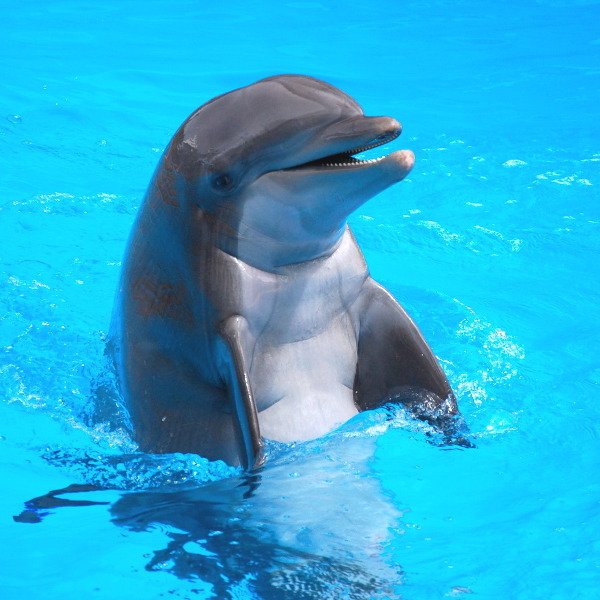 Popular attractions include the Alamo, the San Antonio River Walk and SeaWorld San Antonio. It’s time to enjoy a dream holiday in this scenic American destination, because cheap flights to San Antonio are now available for a limited period! San Antonio is the home of San Antonio International Airport (SAT), a short 10-minute drive from the city centre. Visit the Alamo mission in San Antonio. This historic structure is one of the remnants of the 1836 battle for Texas’s independence from Mexico. For more history, visit the San Antonio Missions National Historical Park & Mission Trail and Market Square (El Mercado). San Antonio’s combination of beautiful settings and a vibrant nightlife scene makes for wonderful experiences. Dine out at one of the many restaurants and pubs that are situated along the lovely and historic San Antonio River Walk. The city of San Antonio provides the ideal opportunity for an enjoyable holiday for the entire family. Take the kids out on a day they will never forget, with visits to the Kiddie Park, Splashtown and SeaWorld San Antonio. Visit San Antonio between the months of November and April (autumn – spring) and enjoy comfortable weather and low hotel rates. Autumn (November) sees a relief from the intense summer (May – September) heat and is the time when the influx of tourists drops, meaning a drop in accommodation rates. The winter season (December – February) offers the mildest weather of the year and the cheapest hotel rates. Spring (March – April) is when the temperatures start to rise while the nights are still cool. The period from November to April also offers low rainfall. Some major events that take place during these months include the Alamo Bowl (January) and the San Antonio Stock Show & Rodeo (February – March). 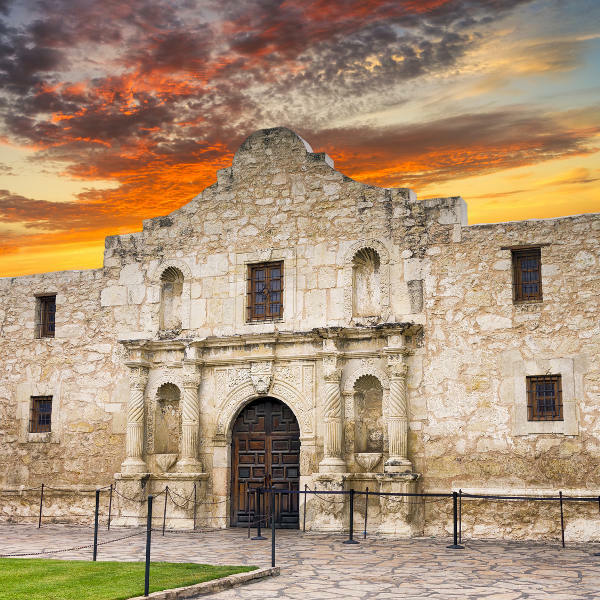 Book a flight to one of the major cities of Texas – San Antonio. This scenic metropolis, sitting in the south-central part of the state, is famed for its history, being the location where Texas established its independence from Mexican rule in 1836. Today, you can visit the Alamo Mission, which was the site of the battle which decided the rest of the state’s history, and established San Antonio as one of its top destinations. Other sites and attractions that tell this city’s story include Market Square (El Mercado), the Mission Trail and the King William Historic District. If you’re an adventure enthusiast, make sure to explore the variety of enticing hiking trails around the San Antonio Missions National Historical Park and the Medina River Natural Area. In addition, there are many running tours through and around the city, as well as ferry tours, bike tours and golf courses. For the animal lovers, San Antonio has plenty to offer as well. Meet all the charming animals at the San Antonio Zoo, the Natural Bridge Wildlife Ranch, the San Antonio Aquarium and SeaWorld San Antonio. 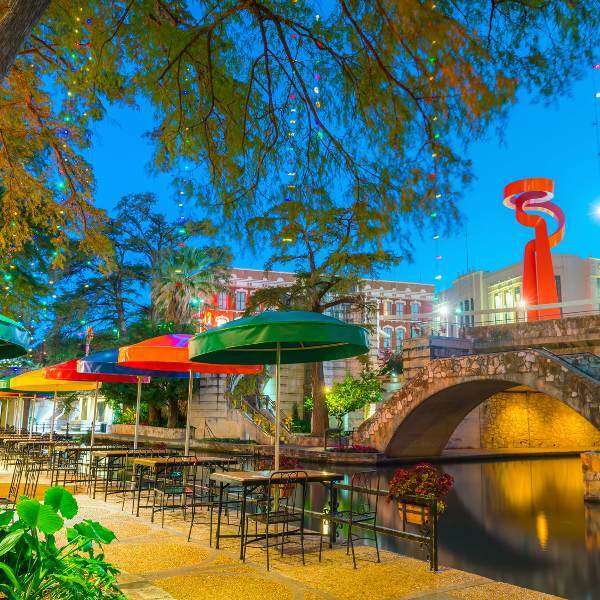 Don’t miss out on the San Antonio River Walk, however, where you can enjoy lovely views across the river while treating yourself to the tasty fare offered at the many restaurants, pubs and cafés situated along the river. Make sure to be there in the evenings to watch this already beautiful setting transform with colourful lights. End a day of exploring the city by relaxing with this gorgeous scene. Compare several airlines and book your cheap flights to San Antonio online at Travelstart! You will most likely encounter homeless people while in San Antonio. They pose no threat as most will simply ask for money before moving on to another person. Certain parts of San Antonio still carry more socially conservative views. While the LGBT community is continuing to gain acceptance across the country, it would be wise to avoid displaying affection in public. It is safe to drive around San Antonio and the rest of Texas by car.